I made a short simploring tour to “The Outer Garden” on Wednesday, March 20th. I came across it once again by scoop.it SL Destinations. And I’m for sure not the first one writing about “The Outer Garden“. Actually there’re many blogs that had reported about it. But for me it was new :-). The Outer Garden exists since New Year Day 2015 and it is steadily developing and changing as far as I understood. The sim is owned and created by bisou Dexler. bisou runs an own blog about The Outer Garden. The Outer Garden is pure fantasy, a white world. It’s filled with art objects and full of light effects. The lateast addition to is is named “Traveling Carnival“. You get there when you use the teleporter, that is interagted into a mirror, right at the landing spot. Of course it is also a white world. 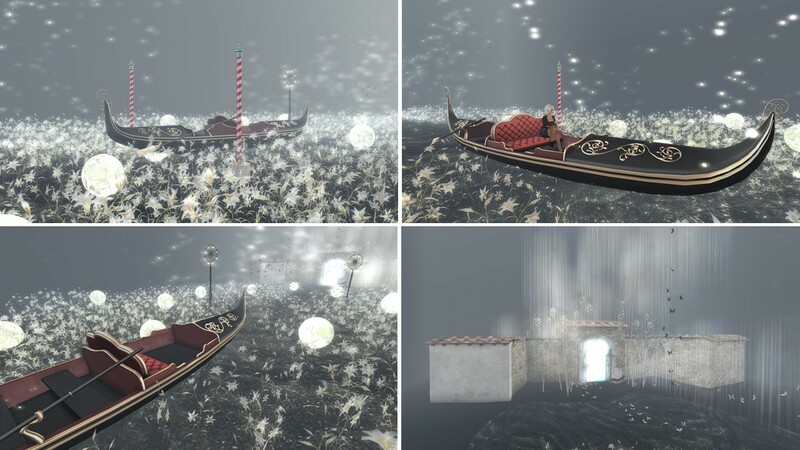 Admist a sea of white flowers and snow crystals in the air is a large Venetian gondel and in the background you can see a building and a door submerged it light. Of course I went there and when I reached the door .. I fall down through the ground to the Ground level. During my journey to the ground level I passed a full train arranged on a cloud (don’t miss it). On the ground level, there’s a lot to discover. You see trees and elements of a fair appear through the fog that mostly covers the ground, through light rays, flying fishes, snow flakes. Some objects are flying, others are on the ground. There’re places to sit and have fun, and there’re a lot of motives for taking pictures. The Outer Garden is, in my eyes, pure surreal art, with a strong touch of fairyland. 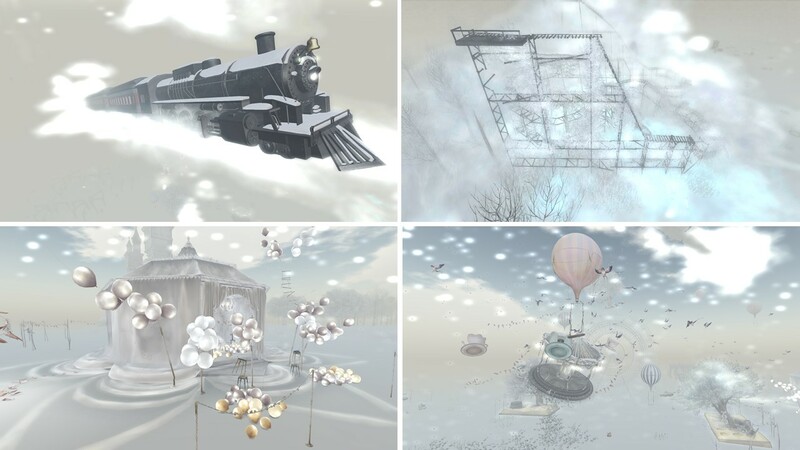 Most of the time, I didn’t change the windlight setting and hence the pictures I took are kept in white colours. But I saw other reports, where the windlight setting was changed and in the end of my visit, I tried that myself – what a difference! The fog on the ground is water and the whole scenery changes a lot. There must be endless possiblities and angles for taking pictures at this beautiful fantasy spot. 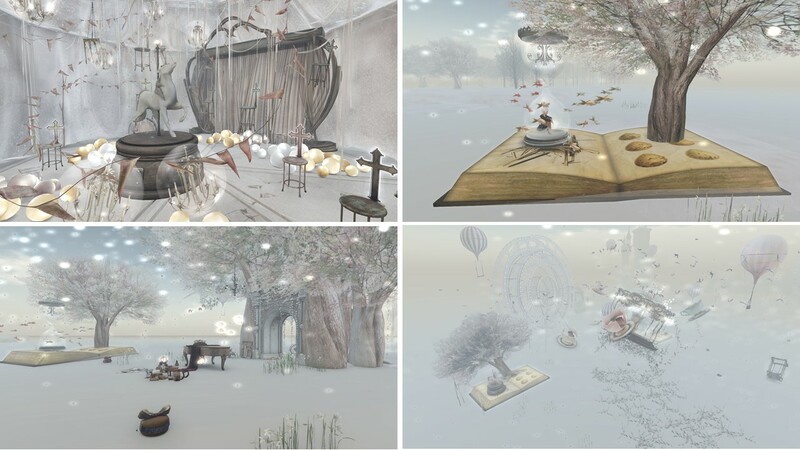 Thank you bisou Dexler for creating this corner of Second Life. I strongly intend to come back and try out more settings for my viewer. I enjoyed my first short visit lot.